Vancouver, B.C. Corvus Gold Inc. (“Corvus” or the “Company”) - (TSX: KOR, OTCQX: CORVF) announces a new Preliminary Economic Assessment (PEA) and a mineral resource update incorporating all drill results through 2014 from the newly discovered YellowJacket high-grade gold deposit (Table 1 and 2) at its North Bullfrog project. The PEA results have outlined a potential robust, high margin, oxide mining project with low development/capital cost projections (Figure 1 and 2) in the current gold price environment. Click here to view table on our website. The Company will file an updated National Instrument 43-101 – Standards of Disclosure for Mineral Projects (“NI 43-101”) technical report (the “Report”) to be prepared by independent qualified persons, which will include the results of the mineral resource update and PEA discussed herein, on SEDAR within 45 days, and investors are urged to review the Report in its entirety. Corvus controls 100% of its North Bullfrog Project, which covers approximately 75 km² in southern Nevada. The property package is made up of a number of private mineral leases of patented federal mining claims and 814 federal unpatented mining claims. The project has excellent infrastructure, being adjacent to a major highway and power corridor as well as a large water right position. 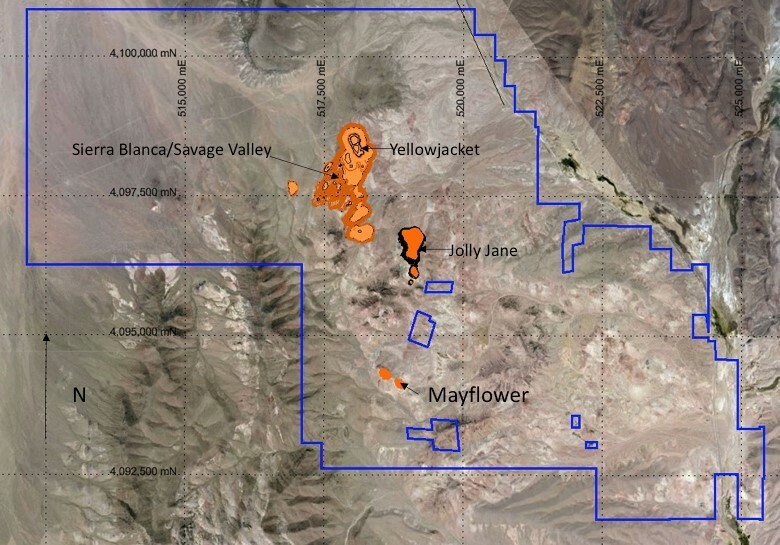 The North Bullfrog project includes numerous prospective gold targets at various stages of exploration with four having the following modeled mineral resources (Sierra Blanca, Jolly Jane, Mayflower, and YellowJacket). The project contains a measured and indicated oxide mill mineral resource of 5.67 Mt at an average grade of 2.22 g/t gold, and 16.67 g/t silver, containing 405.6 k ounces of gold and 3,038.5 k ounces of silver, and an inferred mineral resource of 1.48 Mt at an average grade of 0.0.83 g/t gold and 4.26 g/t silver, containing 39.4 k ounces of gold and 203.4 k ounces of silver. In addition the project contains a measured and indicated, oxide, run of mine, heap leach resource of 23.15 Mt at an average grade of 0.30 g/t gold and 0.46 g/t silver, containing 221.1 k ounces of gold and 344.1 k ounces of silver, and an inferred mineral resource of 176.3 Mt at an average grade of 0.19 g/t gold and 0.67 g/t silver, containing 1,092.8 k ounces of gold and 3,801.7 k ounces of silver. The Qualified Persons, Scott E. Wilson, Stephen Batman and William J. Pennstrom have visited the North Bullfrog site during 2014 and 2015. Mr. Wilson has performed data verification by examining core materials at the site, and has selected quarter core samples to develop independent verifying assays of intervals by the ALS Chemex laboratory in Reno, NV. Geologic data development processes were reviewed and observed during the site visit. All drilling geologic description, assaying data and geochemical data have been provided in a database format to Metal Mining Consultants Inc. for the purpose of estimating the resource. All Qualified Persons have reviewed the News Release and approve its publication. Mr. Scott E. Wilson, CPG, President of Metal Mining Consultants Inc., is an independent consulting geologist specializing in Mineral Reserve and Resource calculation reporting, mining project analysis and due diligence evaluations. He is acting as the Qualified Person, as defined in NI 43-101, for the overall technical report, and the Mineral Resource estimate. Mr. Wilson has over 26 years experience in surface mining and is a Registered Member (#4025107RM) of Society for Mining, Metallurgy and Exploration, Inc. Mr. Wilson and Metal Mining Consultants, Inc. are independent of the Company under NI 43-101. Mr. Herbert Osborne, SME, a consulting metallurgist, has acted as the Qualified Person, as defined by NI 43-101, for evaluation of the metallurgical testing data and estimation of the process metallurgical recoveries. He has over 50 years of experience in mineral process design and operations. He is a Registered Member of the Society of Mining, Metallurgy and Exploration (#2430050 RM). Mr Osborne is independent of the Company under NI 43-101. Registered Member of the Society of Mining, Metallurgy and Exploration (#2430050 RM). Mr Osborne is independent of the Company under NI 43-101. Mr. William J. Pennstrom, Jr., a consulting process engineer and President of Pennstrom Consulting Inc., has acted as the Qualified Person, as defined by NI 43-101, for process operating cost estimation, project capital cost estimation and evaluation of the financial performance for the PEA. He has over 30 years of experience in mineral process design and operation, and has been an independent process and metallurgical consultant for the mining industry for the last thirteen years. He is a Registered Member of the Society of Mining, Metallurgy and Exploration (#2503900RM). Mr. Pennstrom and Pennstrom Consulting Inc. are both independent of the Company under NI 43-101.